Monson: Should BYU bench Tanner Mangum? Come on, get real. 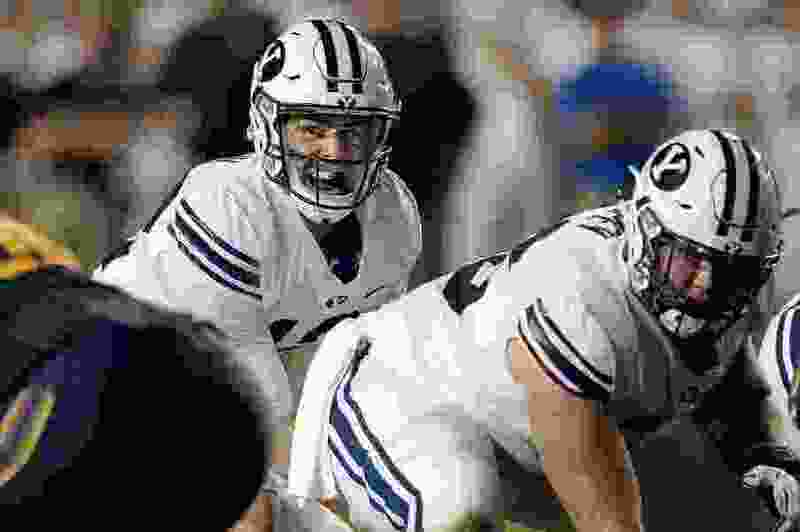 (Francisco Kjolseth | The Salt Lake Tribune) Brigham Young Cougars quarterback Tanner Mangum (12) yells to his team during the second half of the NCAA college football game against California, Saturday, Sept. 8, 2018, at LaVell Edwards stadium in Provo, Utah. BYU football fans calling for a change at quarterback are reacting out of emotion, not logic. And when emotion rules the mind, bigger troubles follow. Let’s circle back and re-establish a few things about the Cougars in 2018. Your team is not that good. There are no great playmakers, especially on the offensive side of the ball. There are no great running backs, no go-to receivers who are sure to pick up that third-down yardage when needed, no established powerful offensive linemen to grade the road, to protect the quarterback, to knock defensive fronts off the line of scrimmage, enabling the kind of comfort that gives a QB or a running back the space and time to thrive — at least not against the better teams on BYU’s schedule. Against the lesser opponents, maybe some of that can happen. What all of that means is the only way the Cougars can score touchdowns against stiff competition is by nibbling away at the field, attempting to keep drives alive by small chunk-lets — maybe four or five yards at a time, working 12- to 14-plays to get to the end zone, hoping for all the world that nobody commits a holding penalty or a false start or that nobody drops a pass or makes some other punitive mistake, killing the humdrum of a drive. All of that puts pressure on the quarterback — because on too many plays there’s nowhere to go with the ball. That’s why when Tanner Mangum did have time and he threw darts to his receivers against Cal, and they dropped the ball, it absolutely crushed BYU’s chances. When he threw an interception late in the game, when the Cougars had a chance to score, it came on a third-and-21 play, hardly the setup for success. Mangum could have played better in that loss, the way he did against Arizona. But it’s worth noting that Cal’s defense was better than Arizona’s, especially along the line of scrimmage, and that the rest of the offense was not generating the kind of gains, especially in the power-run game, that it got against the Wildcats. Had BYU played its A-game against the Bears, it might have won. Instead, it played its C-game, but that goes for the whole lot, not just for Mangum. “There’s enough blame to go around,” is the way Kalani Sitake said it. And the blame landed, as it should, almost everywhere. Blaming the quarterback, calling for him to be benched, is an easy thing to do. But it’s a simple-minded thing. It’s unsophisticated. It’s a desperate, emotional cry. Those same cries were heard among some Utah fans who were complaining about Tyler Huntley’s performance against Northern Illinois, in an offensive showing that garnered a mere 10 points. But when an attack goes subterranean in any given week, it’s much bigger than just the QB. Typically, it’s a group effort. That effort is bound to get ugly again when the Cougars face Wisconsin at Camp Randall on Saturday. That’s because the Badgers are much better than BYU. Their defense is better than the Cougars offense, the same way the Cougars defense is inferior to the Badgers offense. Don’t expect anything remarkable to emerge out of that game. Perhaps BYU can show some toughness, can put up a bit of a fight. But when Mike Tyson faced off against William Hosea back in Tyson’s prime, could anyone have expected Hosea to win, or even to look good? No, they expected exactly what happened — a knockout in the first round. BYU will get knocked out in Madison. And there will be all kinds of reasons for it. But Mangum starting and playing will not be the root of it. During and after the loss, calls for freshman Zach Wilson will come, just as Wilson’s time itself will come. But not yet. Not against foes beyond the Cougars’ reach. After Wisconsin, McNeese State, a team BYU can beat, rolls into Provo. And then, BYU plays at Washington, an outfit that Utah coach Kyle Whittingham calls “as complete a team as there is in the country.” Thereafter is when it gets real for the Cougars, and when authentic judgments about Mangum can be made — Utah State and Hawaii and Northern Illinois at LES, Boise State and UMass on the road, New Mexico State at home, and Utah at Rice-Eccles. If Mangum stumbles badly, go ahead and give the rook a shot and see what he can do. Coaches have already said they’d be open to doing that. But it would not be wise to hand over that opportunity too quickly, because if bad things happen with him under center, and his confidence is messed over, what do you do then? Regression is as likely as progression. Sitake still needs to haul in six wins this season. BYU’s goal in transition from awful to decent is to get itself into a bowl. That would be enough. Getting Wilson ready for next season, and, if he’s good enough, the following season, and the season after that, will come in time. It might come at some point this season. Right now, though, is not that point. BYU fans should think it through before they let emotion rule logic, remembering that their team just isn’t that good, no matter who the quarterback is. GORDON MONSON hosts “The Big Show” with Jake Scott weekdays from 3-7 p.m. weekdays on 97.5 FM and 1280 AM The Zone.